The Ecuador Building was located on the north side of the Avenue of Nations, immediately west of the Bolivia Building, and was a structure of Spanish design with small round towers at its corners. 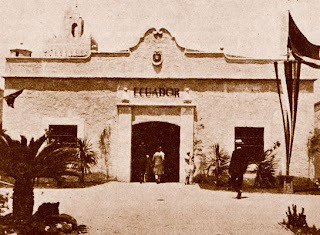 Ecuador was the first foreign nation to pledge an exhibit for the Pacific Southwest Exposition; and when the promised displays did not arrive in time for the exposition's opening, Dr. Victor M. Egas, Consul of Ecuador at Los Angeles, contributed his own collection of Ecuadorian products to the building until the official exhibits arrived on August 3rd. 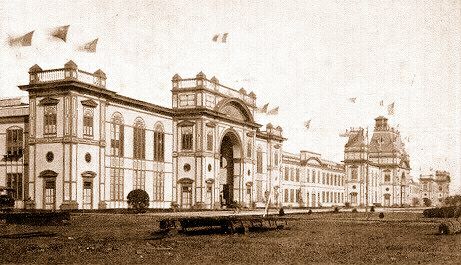 The interior of the building contained fine displays of minerals, balsa wood, cocoa beans, coffee, salt, rubber, textiles, paintings, tapestries, embroidery, antique chests, and postage stamps.